The two factors you need to be aware of are the screen size and the size of the board that the screen printers use. They may not always be the same. You need to get those specifications from your t-shirt printing company. Subsequently, from the screen size limitations or wanting to print on the back and front of the shirt, you will need to have multiple "placements." Each placement is a separate screen and additional cost will be added. Printers for t-shirts use solid colors, so often a design must be simplified down to few colors or the cost of the t-shirt can get quite expensive. If you have a two colors in your design, you basically have three colors to work with (the t-shirt color and two additional colors). However, you can get different shades of the same color by adjusting the transparencies (in Illustrator or PhotoShop) in your designs. For example, if you are using the color blue, by adjusting the transparency, you can create both light and dark blue, without paying for two separate colors. The number of passes that a printer company has will affect the cost as well as the look. If you want the t-shirt to have a bold look, then you will need to have at least two passes with a "flash" in between (a process used to dry the ink of the first color pass). If you want to have more of a worn-in look, then one pass will work and will let the fabric flex more naturally. Buildup of color on a t-shirt can make the t-shirt less flexible in the design area. Something worth mentioning is that if you have a light color on a dark t-shirt, they may pass over with a white color first then pass with the actual color. I suggest you talk with your printer about how they are going to handle your design. T-shirt cost can span from cheap to really expensive. In my opinion, it is better to have cheaper printing costs and a higher quality material for your t-shirt. Our most successful t-shirts at Highlands have been the higher quality t-shirts. Good design definitely helps, but people usually won't wear something that feels uncomfortable, no matter how good the design. T-shirt fabrics can range from cotton to dual and triple blends, and we like to use dual and triple-blends. T-shirt brands also vary in the way they fit. 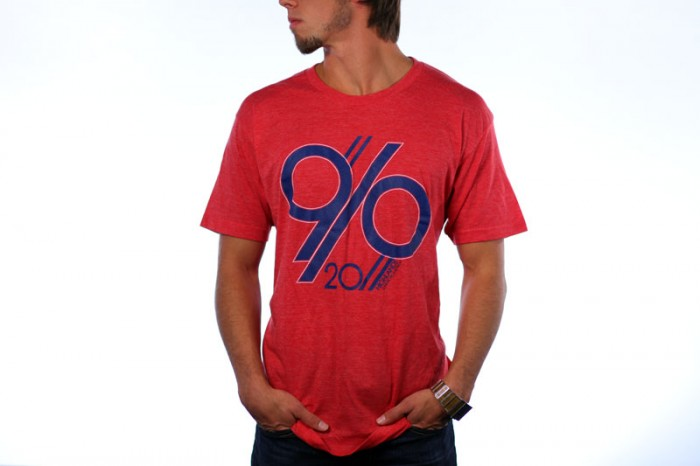 The standard t-shirt for different brands will vary in material based on the company you buy them from. It may take a few different t-shirts to find out what materials you like, and the size of different companies' shirts can also run large or small. For more information on t-shirt design, please follow the break. 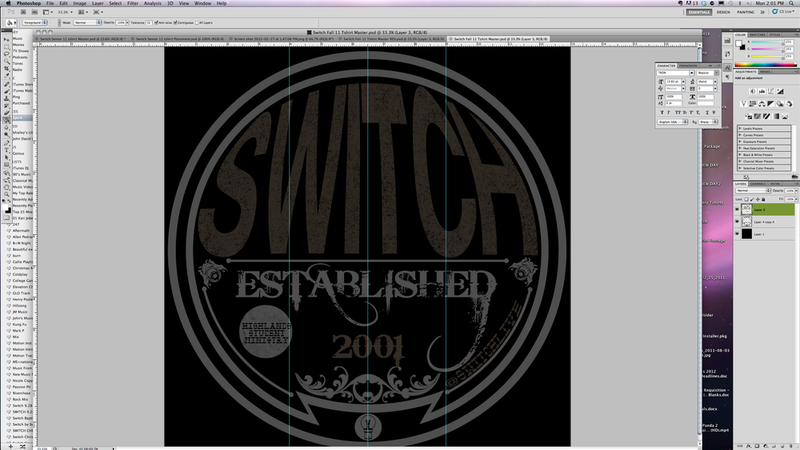 When I design, I usually begin with a blank 15x15 inch, either Photoshop or Illustrator file. I don't worry about screens size until a little later in the design process when the concept is coming together. I always ask myself how the design will look from farther away and how it will look on a fabric. Here is an example of a t-shirt design for Highlands Student Ministry. I took the idea off of an "Obey" t-shirt i like. This design was designed at 13 x 13. The final print turned out to be 11.5 x 11.5. Designing larger in Photoshop is very important. This screen print was - 1. Placement (a single screen print) and 2. Color (the screen contains two colors in it). 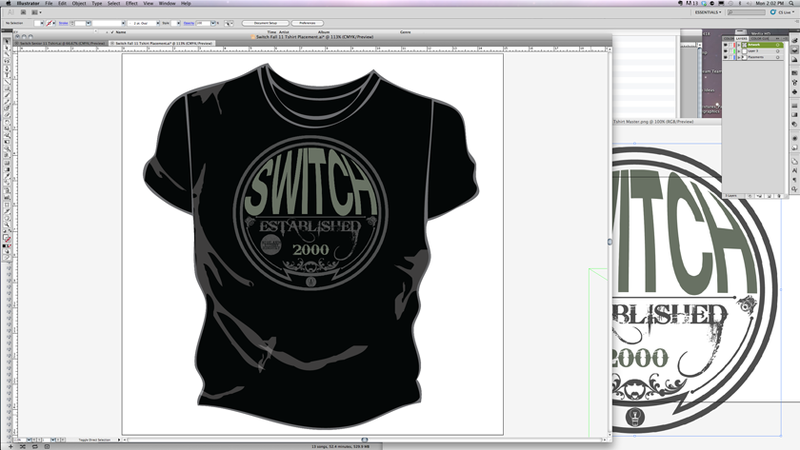 I also laid out the design on a t-shirt template to help me visualize what it would look like. And here is the final shirt on a model. Have fun designing your next t-shirt! If you end up with a cool design and a quality t-shirt that feels good, it can be one of the best promotional things you can do for your ministry.